(2) The non metallic form is a grey powder. 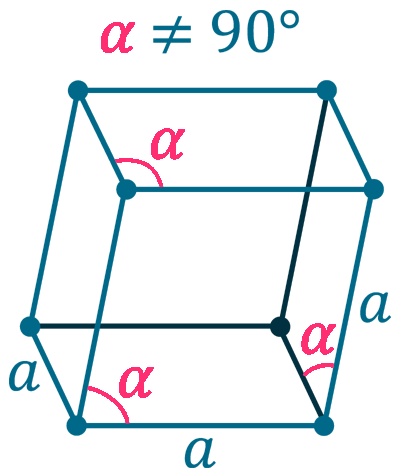 Antimony is a poor conductor of heat and electricity. 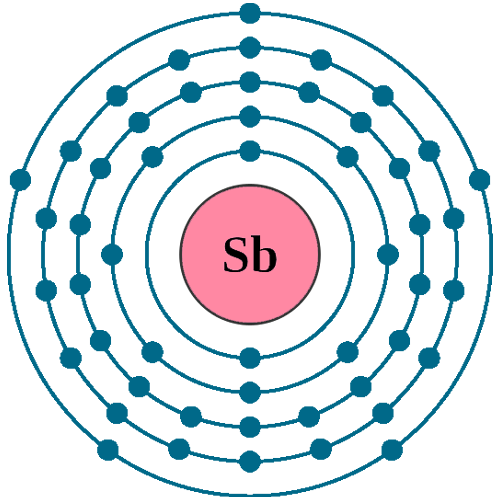 At red heat, Reacts with water and form Antimony (lll) oxide: Sb reacts slowly at ambient temperature. Antimony (Sb) dissolved in hot concentrated sulphuric acid (H2SO4) or nitric acid (HNO3) and forming a Sb(III) solutions. The sulphuric acid reaction produces Sulphur dioxide SO2 gas. Antimony does not react with hydrochloric acid (HCl) in the absence of oxygen. The lower-grade ores are reduced in blast furnaces while the higher-grade ores are reduced in reverberatory furnaces. Pure antimony used in electronics industry to make certain types of semiconductor devices, such as infrared detector, diodes and hall-effect devices. A Antimony is alloyed with lead to improve their hardness and mechanical strength. A Antimony alloys are used in Batteries, antifriction alloys (such as Babbitt metal), type metal (linotype printing machines), electrical cable sheathing, small arms and tracer bullets. 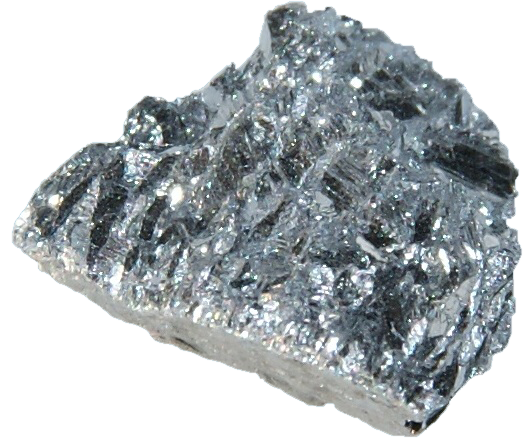 Antimony is mainly used in the trioxide for make flame-proofing compounds, paint, glass art, and as an opacifier (Titanium dioxide, TiO2) in enamel. Biological role: Antimony and many of its compounds are toxic. Inhalation of antimony trioxide is considered harmful and suspected of causing cancer. Antimony is not an abundant element, but is found in over 100 mineral species. 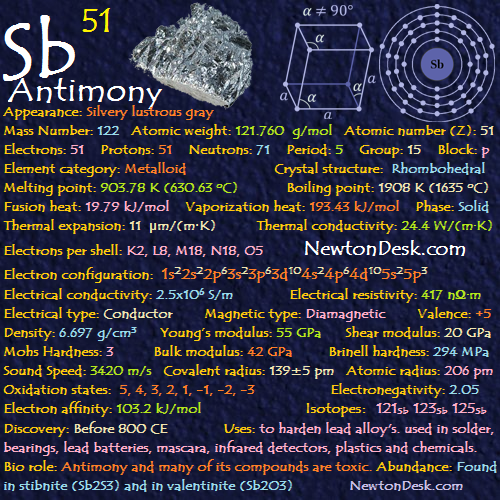 Antimony can be found as the native metal. 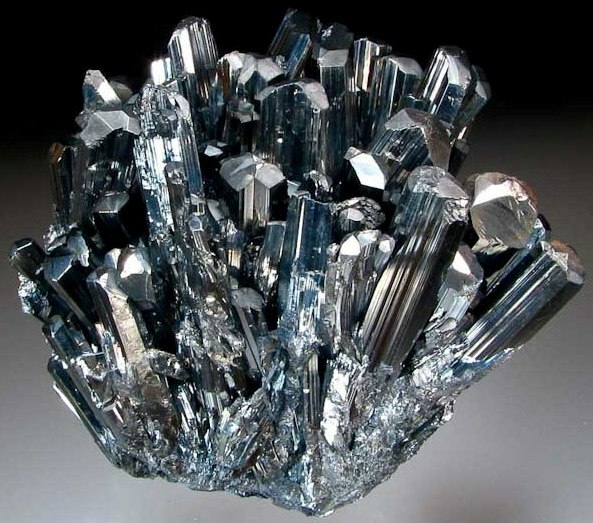 It is most often found in Stibnite (is a sulfide mineral with the formula, Sb2S3) Sometimes called antimonite. 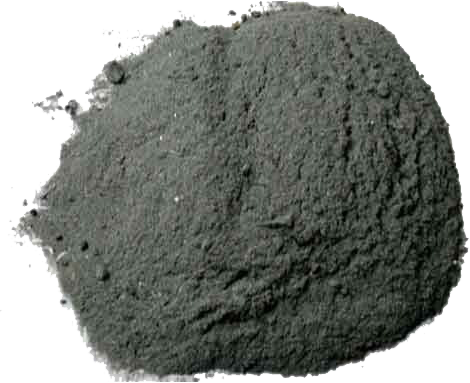 It is extracted by roasting the antimony trisulfide (Sb2S3) to the oxide, and then reducing with carbon. Annual world wide production is around 53,000 tons.